A city is a subtype of municipalities in the Canadian province of Ontario. A city can have the municipal status of either a single-tier or lower-tier municipality. Municipalities are administrative and political boundaries and in most cases do not represent the boundary of a discrete urbanized area or a heavily integrated set of one or more urban areas and their adjacent economically-integrated rural area ("metropolitan area"). In many cases, several cities/municipalities will comprise an actual continual built-up area while in other cases a municipality will consist of more than one urban area (often referred to as "population centre" in Canada). An example of the former is that the adjacent municipalities of Toronto and Mississauga plus Oakville to west, eastward to Ajax , and as far as Orangeville and Newmarket in the northwest and north are all part of the Toronto urban area and Toronto metropolitan area. An example of the latter is the single-tier municipality of Norfolk County which has a few discretely separate population centres within: Dunnville, Caledonia and Hagersville. Ontario has 52 cities that had a cumulative population of 9,900,179 and an average population of 190,388 in the 2016 Census. Ontario's largest and smallest cities are Toronto and Dryden with populations of 2,731,571 and 7,749 respectively. Ontario's newest city is Richmond Hill, whose council voted to change from a town to a city on March, 26 2019. Previous to that, Markham changed from a town to a city on July 1, 2012. Under the former Municipal Act, 1990, a city was both an urban and a local municipality. Under this former legislation, the Municipal Board could change the status of a village or town to a city, upon review of an application from the village or town, if it had a population of 15,000 or more. The Municipal Board could also incorporate a township as a city under the same conditions with the exception that the population requirements was 25,000 or more. In the event an application was received from a village, town or township located within a county, the application could have only been approved by the Municipal Board if authorized by the Minister of Municipal Affairs. "existed and did not form part of a county, a regional or district municipality or the County of Oxford for municipal purposes" became a single-tier municipality yet retained its name as a city. The current legislation also provides lower and single-tier municipalities with the authority to name themselves as "cities", or other former municipal status types such as "towns", "villages" or "townships", or generically as "municipalities". ^ The Barrie census metropolitan area (CMA) is formed around the City of Barrie. 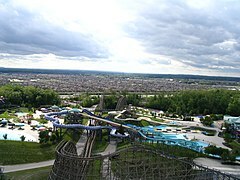 ^ Brampton is Canada's ninth-largest city. ^ The Brantford CMA includes the City of Brantford as well as the County of Brant, which is a single-tier city. ^ The City of Cambridge, as well as the cities of Kitchener and Waterloo, form parts of the Kitchener - Cambridge - Waterloo CMA. ^ Dryden is Ontario's smallest city by population. ^ Greater Sudbury is Ontario's largest city by area. The Greater Sudbury CMA is formed around the City of Greater Sudbury. ^ The Guelph CMA is formed around the City of Guelph. 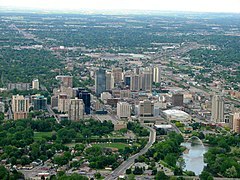 ^ Hamilton is Canada's tenth-largest city. The Hamilton CMA includes the cities of Burlington and Hamilton. 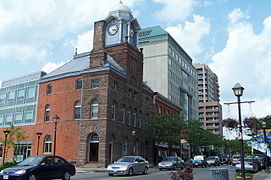 ^ The Kingston CMA is formed around the City of Kingston. ^ The City of Kitchener, as well as the cities of Cambridge and Waterloo, form parts of the Kitchener - Cambridge - Waterloo CMA. ^ The London CMA includes the cities of London and St. Thomas. ^ Mississauga is Canada's sixth-largest city. ^ The City of Niagara Falls, as well as the cities of Port Colborne, St. Catharines, Thorold and Welland, form parts of the St. Catharines - Niagara CMA. ^ The Oshawa CMA is formed around the City of Oshawa. 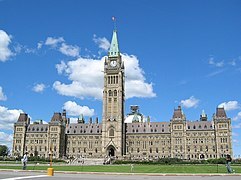 ^ Ottawa is Canada's capital and fourth-largest city. The Ontario portion of the Ottawa - Gatineau CMA includes the cities of Clarence-Rockland and Ottawa. ^ Pembroke is Ontario's smallest city by area. ^ The Peterborough CMA is formed around the City of Peterborough. ^ The City of St. Catharines, as well as the cities of Niagara Falls, Port Colborne, Thorold and Welland, form parts of the St. Catharines - Niagara CMA. ^ The Thunder Bay CMA is formed around the City of Thunder Bay. ^ Toronto is Ontario's capital and Canada's and Ontario's largest city by population. The Toronto CMA includes the cities of Brampton, Mississauga, Pickering, Toronto and Vaughan. ^ The City of Waterloo, as well as the cities of Cambridge and Kitchener, form parts of the Kitchener - Cambridge - Waterloo CMA. 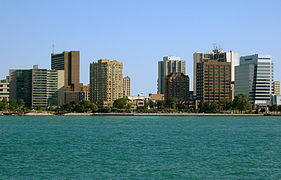 ^ The Windsor CMA is formed around the City of Windsor. ^ a b c "subdivisions (municipalities) and designated places, 2016 and 2011 censuses – 100% data". Statistics Canada. ^ "Richmond Hill Becomes a City". RichmondHill.ca. Retrieved 27 March 2019. ^ "Markham to change from town to city". CBC News. May 30, 2012. Retrieved January 3, 2014. ^ a b c d "Municipal Act, R.S.O. 1990, Chapter M.45". Service Ontario. Retrieved June 29, 2013. ^ a b c d e "Population and dwelling counts, for Canada, provinces and territories, and census subdivisions (municipalities), 2011 and 2006 censuses (Ontario)". Statistics Canada. May 28, 2012. Retrieved January 3, 2013. ^ "Population and dwelling counts, for Canada, provinces and territories, and census divisions, 2011 and 2006 censuses (Ontario)". Statistics Canada. January 30, 2013. Retrieved June 27, 2013. This page was last edited on 13 April 2019, at 15:31 (UTC).